There is nothing to shout about this post. 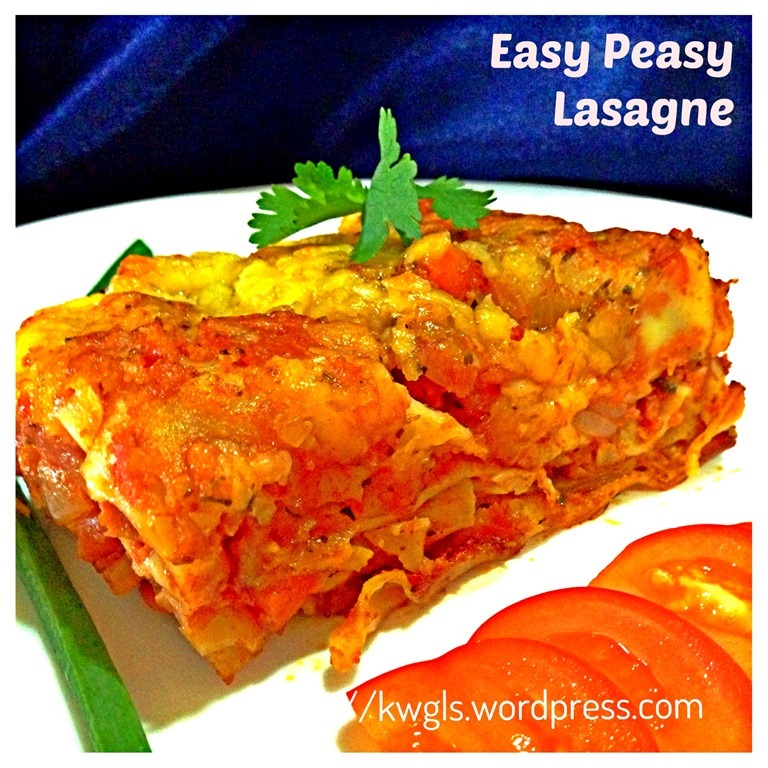 A simple lasagne tailored to meet my taste buds. 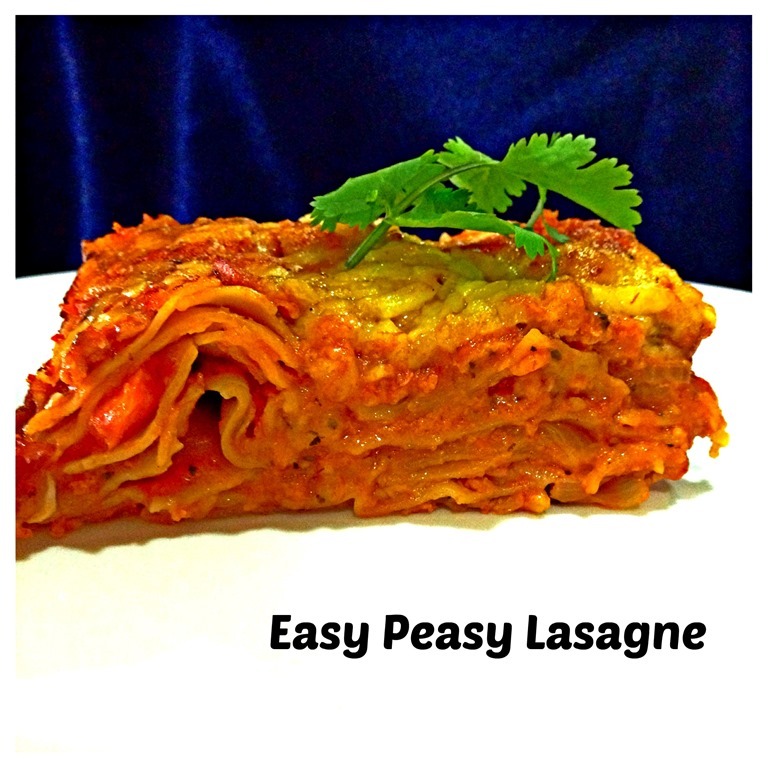 Since young, I am not taking beef…I do not have many chances to eat lasagne because it was usually served using beef.. Looking at the ingredients, I knew I will like it. I decided to try, but instead of beef, I have substituted with pork and I believed minced chicken is equally applicable. 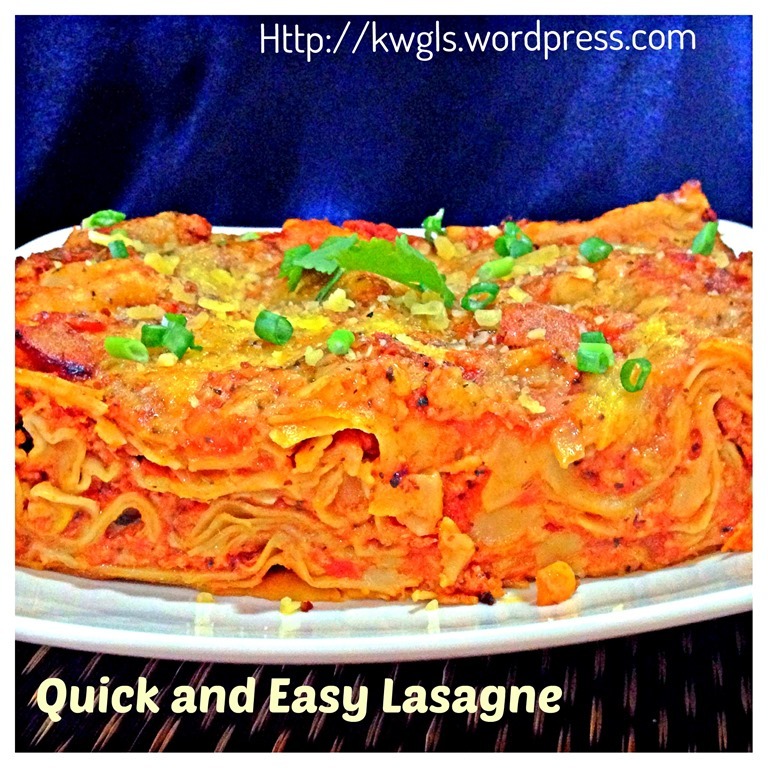 On one of the trips to a big Singapore supermarket, I saw this semolina lasagne sheets, I decided to try making it for our dinners.. I have prepared this based on the normal way of spaghetti preparation. Instead of using beef, I used minced pork. 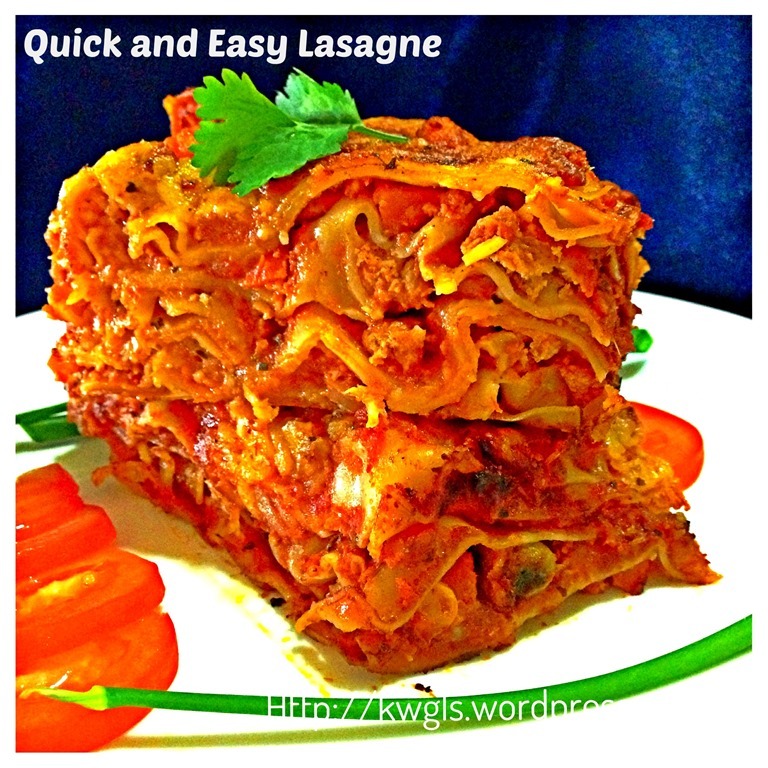 Preparation is very easy as I followed exactly the instructions as in the package and what came out is a delicious “tin” of lasagne. (Note that as I do not have any casserole dish big enough for the lasagne, I have used an 8” detachable baking tin instead.) Please follow the packaging instructions in the lasagne sheets that you have purchased as every brands may be different slightly. This set of instruction is from the lasagne sheets packaging. Every brand may have different instructions. Therefore, prepare it in accordance with the packaging instructions. This post aims to give readers some pictorial illustrations to complement your packaging instructions. 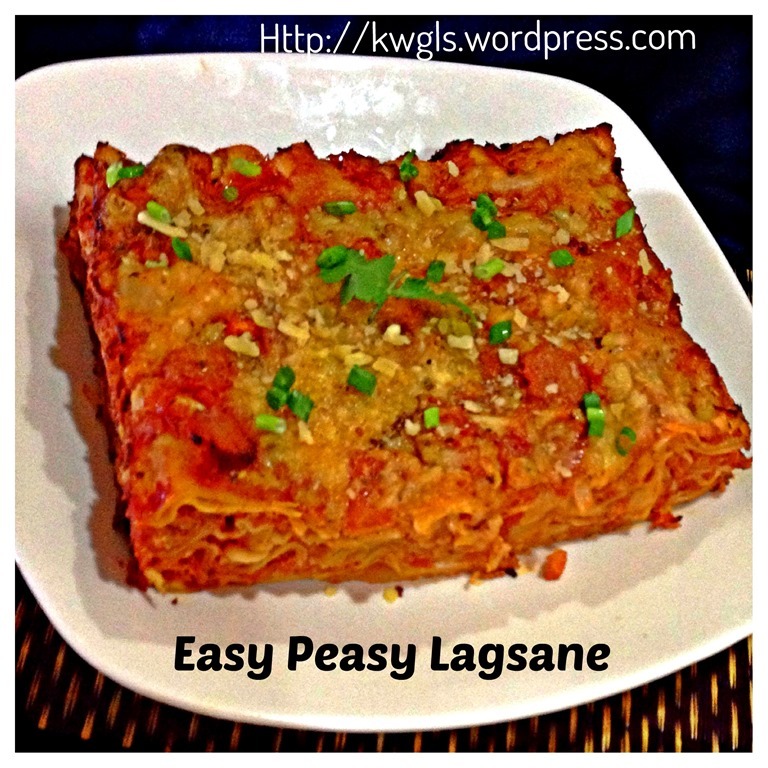 Lightly greased an 8” square baking tin or your preferred casserole. In a hot sauce pan, put the olive oil and onion. Stir fry until the onion are soft. 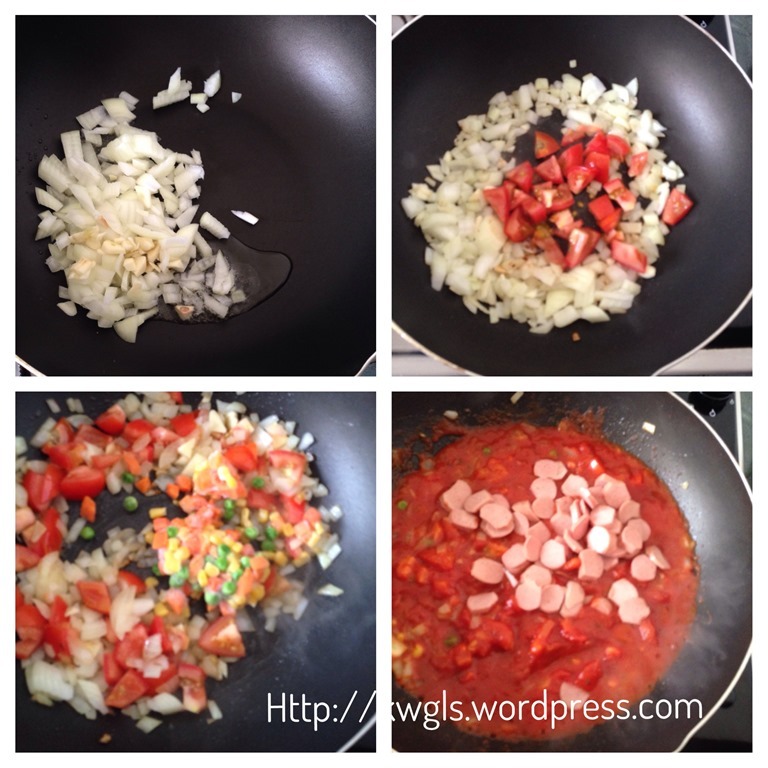 Add mixed vegetables, tomato cubes, minced meat and stir fry for 2 minutes. 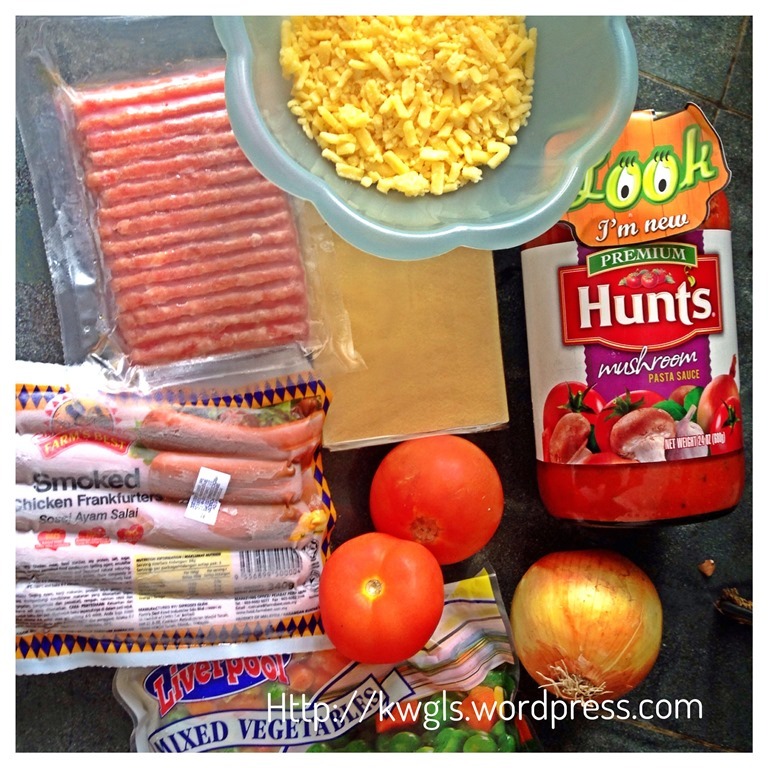 Add pasta sauce and cut chicken franks. 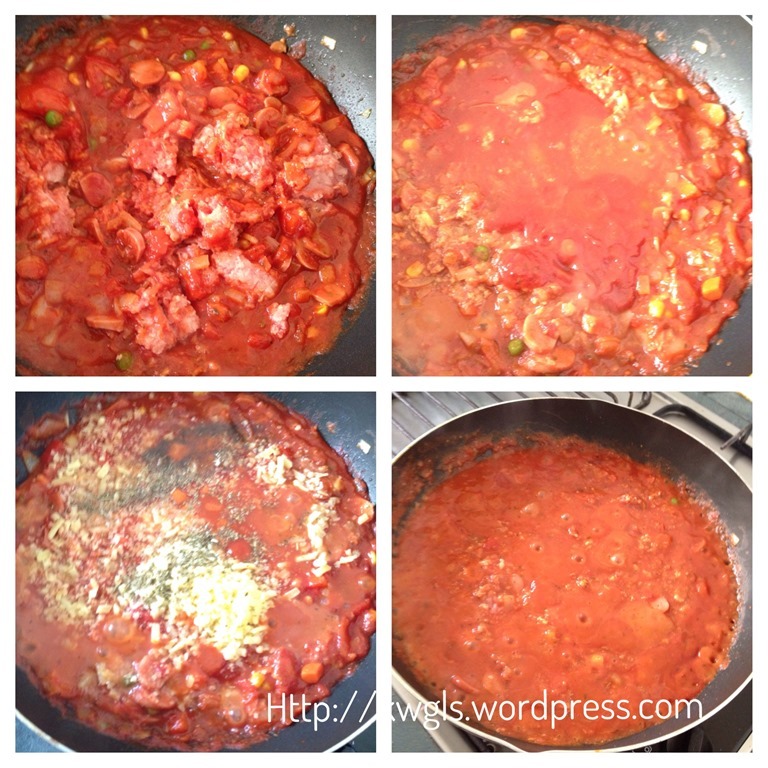 Let it simmer for about 3-4 minutes or until the meat and vegetables are soft and soak all the pasta sauce. Should the need arises, add some water. Add half of the cheeses and let it simmer for another 1-2 minutes. Off the heat and set aside. Lightly grease a baking tin. 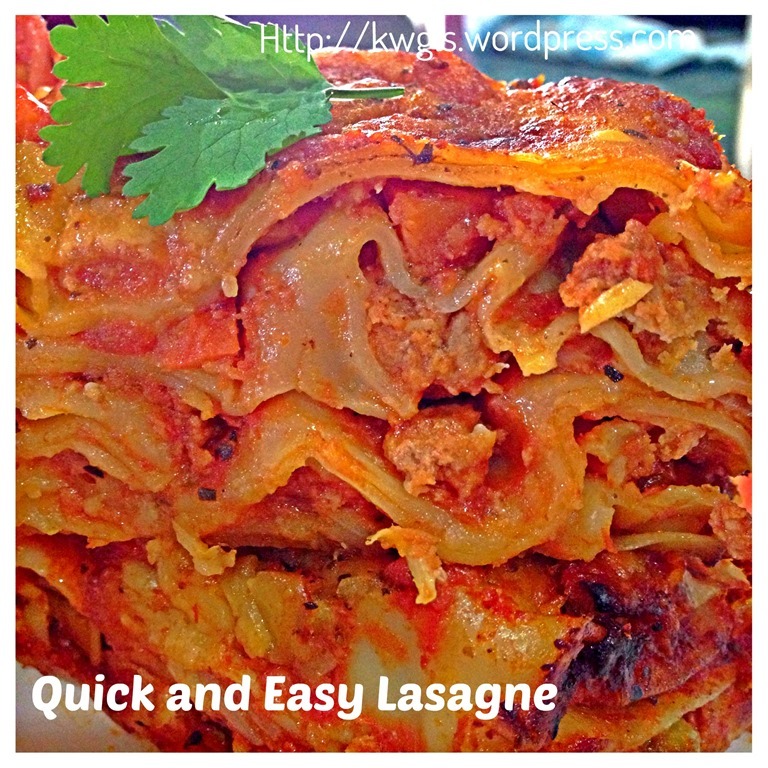 Put a few pieces of the lasagne sheets to cover the bottom. 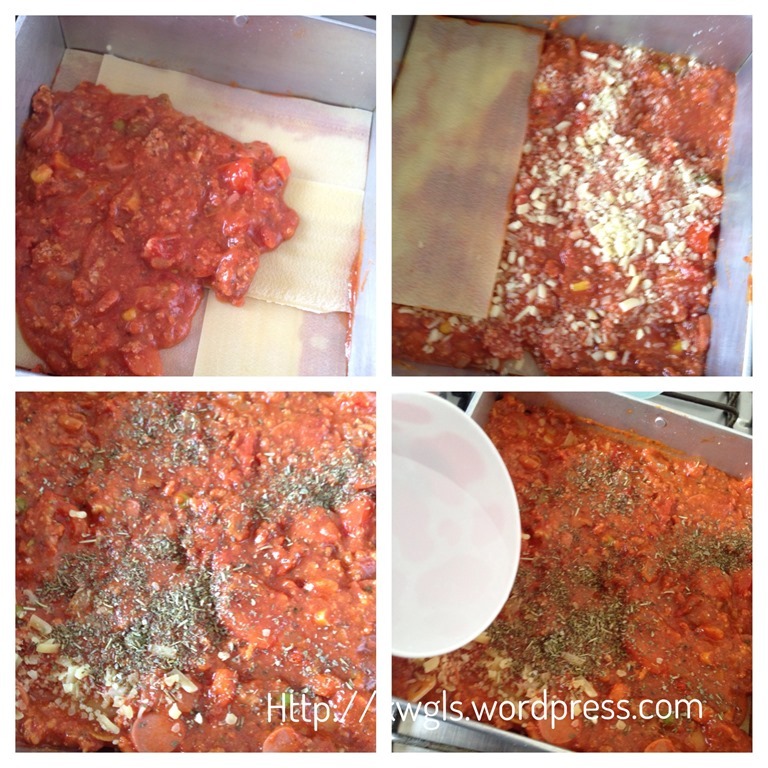 Add in some pasta sauces, level it and sprinkle generously the cheeses on top of the pasta sauce. 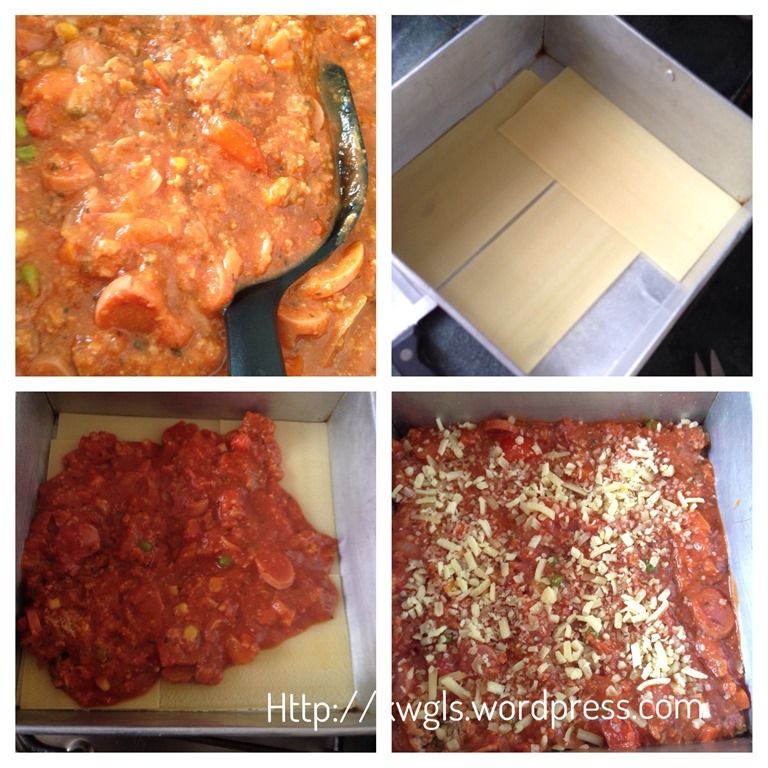 Put another layer of lasagne sheets followed by pasta sauce and cheeses. Do the same for the remaining until the pasta sauces have finished. On the last layer, sprinkle generously with Italian herbs and cheeses. Add about half a cup of water in the baking tray. 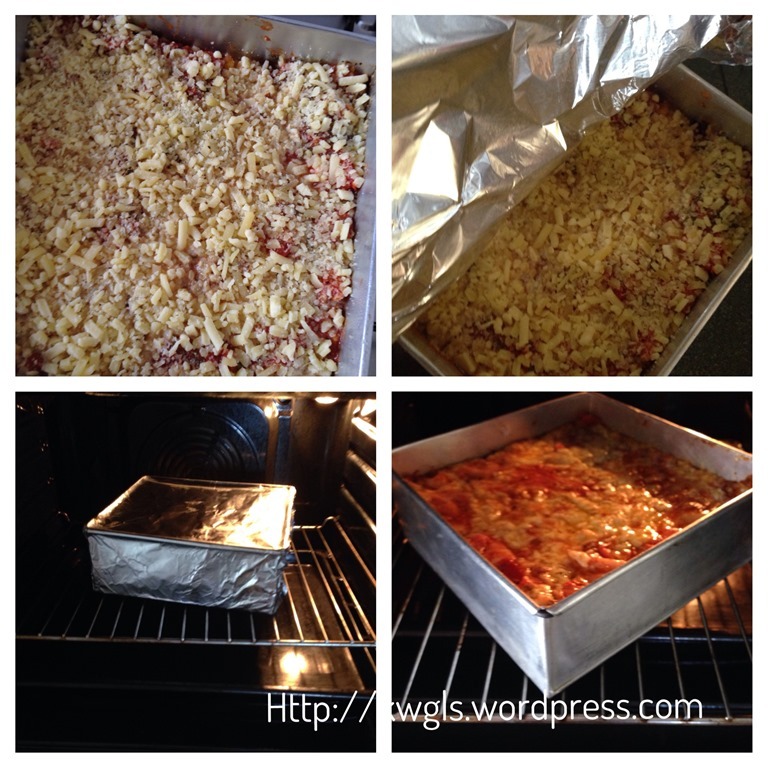 Use an aluminium foil to cover the baking tin. Bake in the preheated oven at 180 degree Celsius for 45 minutes. After 45 minutes, open the aluminium foil, and continue baking for another 15 minutes. Best served hot with additional parmesan cheeses and desired fresh herbs. Again, a simple dish to prepare. Nothing to shout about. 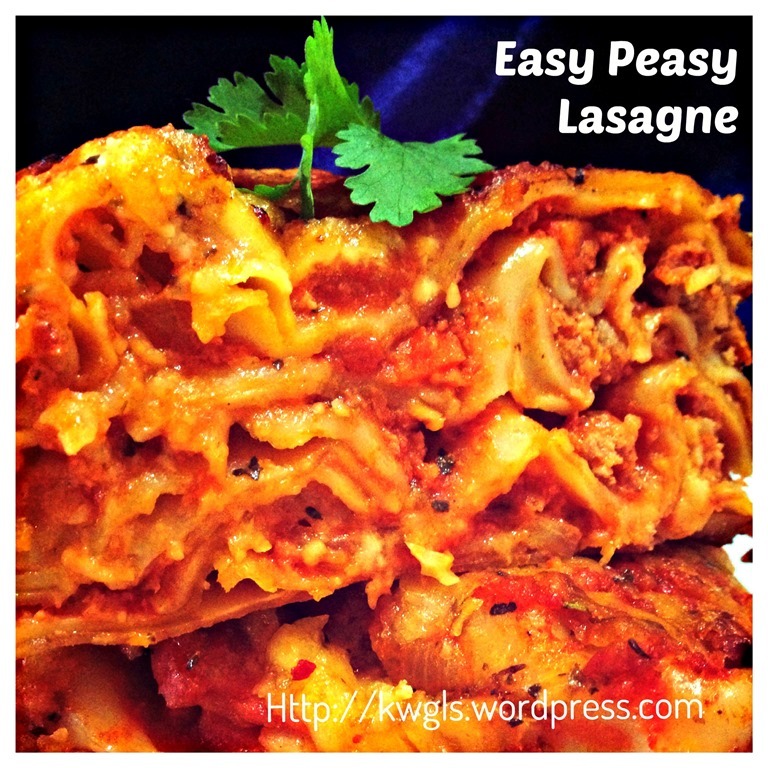 Just follow the packaging instructions and you can have some delicious lasagne. 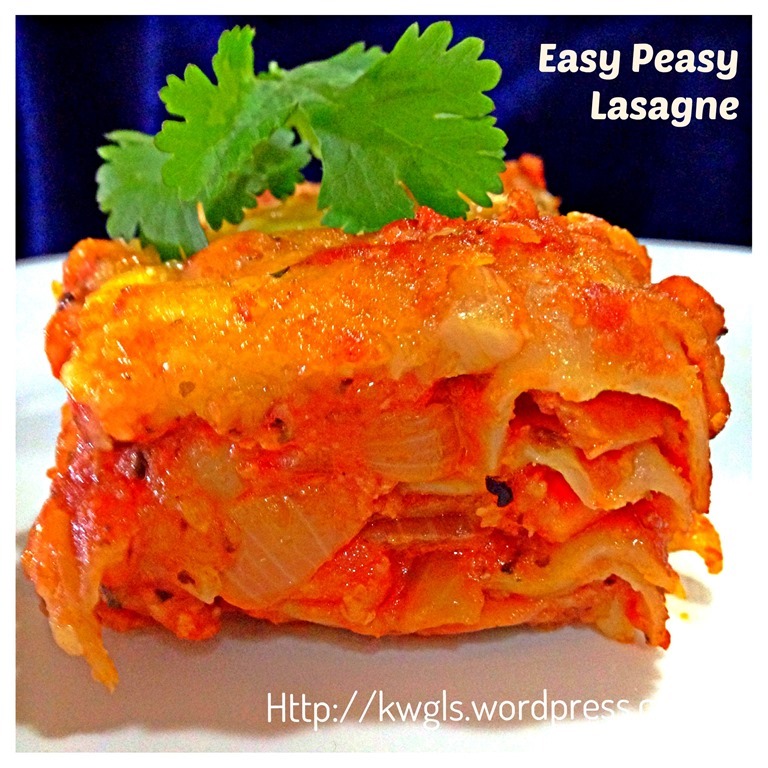 I will definitely prepare this again as it is well liked by my family members. Hope you like the post today. Have a nice day and cheers. 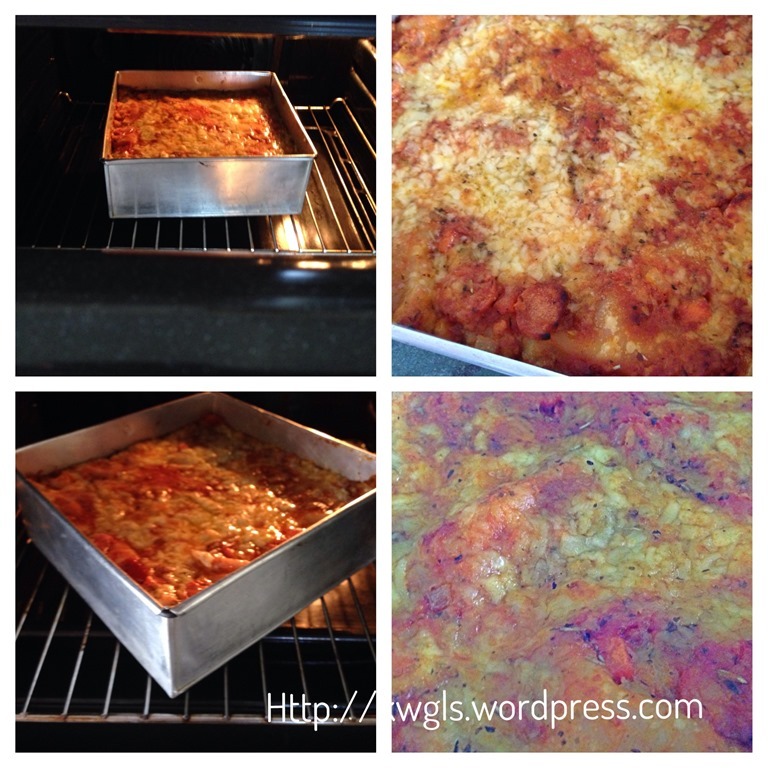 This entry was posted in Christmas 2013, Dish, Food Preparation Series, Western Dish and tagged 8, GUAI SHU SHU, Minced Pork Lasagne, postaday. Bookmark the permalink. My husband would just loooooooooooove it!! This looks great Kenneth! Thanks for sharing on The Four Seasons Blog Hop! Sandra from Scrumptilicious 4 You!